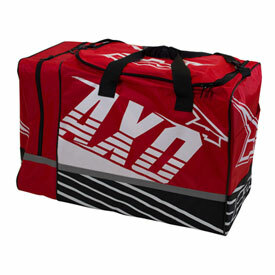 Please see our Gear Bags category for more choices. Heavy Nylon materials used throughout construction. 2 separate vented storage areas featured in design. Abrasion resistant base material resists wear. Webbing carry handles with Velcro grip. I highly recommend this bag! I ordered one of each color! 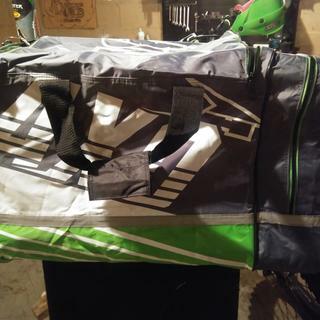 My kids race BMX bikes and ALL of their gear fit in this bag with room for spares! The side pocket is perfect for a helmet! I would definitely purchase again! The customer service was amazing and shipping was awesome! I need more gear after buying this bag. Buy this bag! Seriously I hadn't bought a gear bag since 04' and was previously using a Rubbermaid tote to pack everything around. I came hear to buy a different bag, but after seeing this and reading other reviews, I figured ide give it a shot. It fits everything! I have two sets of gear, boots, helmet, two pair of goggles, roost guard, and a camel back in there. It's not even close to full. The side pocket is still empty, which I will probably use for a fresh set of clothes. I can't comment on durability yet, but for $40 you seriously can't beat it. No more lugging a tote we used to store Christmas decorations in to the track. If you have made it this far and not added it your cart, what are you doing? If this review doesn't convince you then your not gonna buy it and should just move on. Really nice bag for the closeout price of $39. Bag has more room than i had imagined just going off the picture. 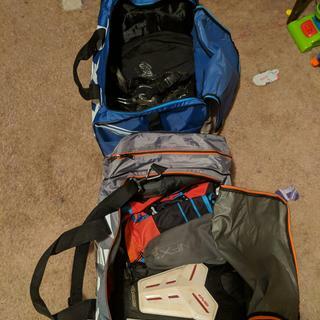 I can fit ALL of my gear in this bag, including boots and helmet! And still have some room to spare. And still some room for maybe extra clothing, goggles etc. Great gear bag, especially for the price! Nice bag, everything fits and a great price. Hopefully it last a long time. Nice bag. Seems to have strong zippers. Perfect size, fits all my gear and tons of extras. Great price! holds more gear than it looks like it can strong and stays clean vrey nice bag. Best thing about this bag is dirt and mud don't stain it. Great bag with one drawback. Okay for the price this bag holds up well and has plenty of room but one drawback. When you fill it with gear, and I don’t mean overfill, the handles are so short you can barely get them together with the Velcro wrap. 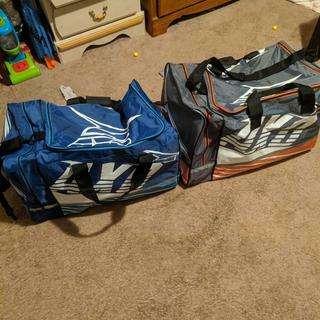 Bought these gear bags for my kids and they are absolutely perfect for what they need. 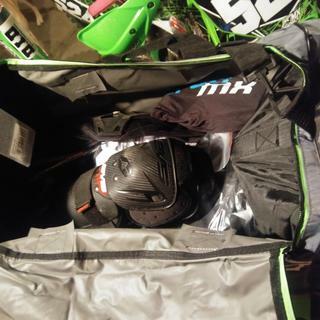 Helmet, Goggles, 5 sets of gear, knee guards and chest protector all fit with room to spare. Do wish it has a separate zipper for the gloves and goggles though. Best bang for your buck if you don’t have to carry it far. I’m giving this bag 4 stars because it is the biggest “gear” bag you will find for the best price but I can tell that it is lacking in the Durability department. I use it to keep all my gear in when I move it from my house to travel trailer on race weekends. I wound not recommend checking this bag through an airport as it may come through the baggage claim with a tear or busted zipper etc. all in all it is a great weekender bag just like the name says. Great bags for the price. Bought two of these bags for my kids motorcycle gear. Bags are huge and seem to be well built. Couldn’t beat the price. Good bag for the price. The boot section is not tall enough or big enough to fit both boots if you have anything over a size 8 or 9 in adults. Good product for the price though and would recommend it to anyone looking for a inexpensive gear bag. 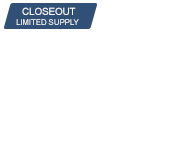 We've got 4 of these for our snowmobile gear and they work great. Great sized bag at a great price. Easily fits all riding gear in. Great bag for the price! Has tons of room and fits all my sons gear with plenty of room to spare. I’ll be getting one for myself. This is the perfect bag for my style of riding. I go out with my family or friends once or twice a month (I don't have too many accessories), so it fits all my gear with ease. Fly gear is great quality and fit. Very durable and comfortable at a great value!! Wanted a gear bag as i was keeping everything in a tote. This bag is very nice and well built. And as a bonus it is a lot bigger than i expected. Axo Weekender Bag great bag and great price. Bag works great for what I have. Have plenty of extra space in this bag. Decent price. Can put a set of gear, helmet and boots in it. Reasonably priced, good value. You can not compare this to an Ogio 9800 sled, this is a quick grab bag for a day ride. No wheels, no extendable handles, no slick compartments. Just hammer and nails for what a basic gear bag should be. Material seems weather proof, but maybe a little on the fragile side. Zippers are not super heavy duty either, but for the money this is an outstanding bag. I bought 4, one for my son and one for my buddy and his son. No regrets. This was a gift for my son who totally loved it. I like the bag. It holds all my gear. The zipper seems a little week, but should be fine if you are careful. I needed a gear bag and chose this bag because of the value. I don't need an expensive bags and this one works perfectly. All my gear fits well, with a little room at the top. I pack the bag the same a in the product video. It seems like the quality of the bag will hold up for some time with my usage. I love the bag. It’s heavy duty and big. Both my wife’s and my riding all fit it with room. Bag is able to fit plenty of gear for a day or two with extras. Personally my boots are too much of a mess to bother putting in a bag so I rarely do unless they've just been cleaned thoroughly. Tight squeeze in the end pocket for size 10 men's Sidi's. I'll say the bag is constructed pretty well. It could maybe be a little more beefy for longevity but I see it as a midrange product at a budget price. I'll probably still be using this thing 10 yrs from now. Great bag for the price. It holds all my riding gear and then some! I keep my boots, helmet, goggles, chest protector, gloves pants, Jersey, knee pads and spare socks, spare pants (jeans usually) also some tools for my bike, ie.. sparks plug wrench, spark plug, a few screw drivers, and a few wrenches in this bag. I still have plenty more room more STUFF! Great purchase, great product! Everything as advertised. I put my helmet, knee braces, compression suit, boots, and all other riding gear inside. There's nothing fancy about this bag but it does what it's supposed to very well. I can't speak to the durability because it's new. Very glad i bought it. It has enough room for everything and keeps my helmet in a separate compartment. Great value too!!! Alright little bag have 2 for son/daughter. Perfect for the weekend warrior. I carry my boots, socks, pants, Jersey, gloves, helmet, goggles, knee pads, elbow pads, and my GoPro camera case with a little room to spare. Very affordable and well made. Good quality with an affordable price. Holds all my gear nicely as well as my tools and spare gear. This bag is good for the price. I purchased 2 of them since they are cheap. The bag is made of the same material that the children's book bags at your local store are made of. I don't think it will last more than a 1-1.5 years of continuous use. There is a reason other gear bags are almost $100. You get what you pay for. Great size. Not too big and not too small. The only thing, is I wish it had another side zip up pouch. But, not a deal breaker. I purchased three of these. One for me and each of my boys that ride. Great price. I needed a bag and really didn't feel like spending a fortune this time. Bag is large and can hold pretty much everything you need. Just like it says, big ol' gear bag. Fits my helmet and boots no problem, with a lot of room to spare. Can't beat the price, if you need a lot of room, buy two!. Bought two of these for our kids. They were much bigger than I anticipated and can fit all their gear and more in each bag. Good quality bag for a little one if you don’t need to bring too many things. I use it for my sxs helmet and gear. Huge!! Pictures don’t do there justice get this bag is you need a lot of room. Could I fit a helmet and boots in this along with my neck brace? BEST ANSWER: Yes, I comfortably fit 2 helmets, 2 pairs of boots, my neck brace, body armor, riding gear, goggles, and waterpack in it. Perfect size to me. Not stupidly big, but enough for about 2 sets of stuff. Yes you can. But it will have to all go in the main compartment. The side zipper isnt big enough to fit boots in. Yes. I keep my alpinstar Boots in the front zipper area, then my helmet, pants, jersey etc in the main one. BEST ANSWER: No, it's not waterproof but it is water resistant. In practical terms, it will keep your stuff dry as long as the bag doesn't get dramatically soaked. I've left it in the back of the truck when riding while it's raining and everything's been fine, but if it's exposed for too long moisture will work it's way in to the bag. Won't be dripping wet, but your equipment will be noticeably moist.. The material is pretty water proof. It has a plastic type coating on the inside. The zippers are not waterproof though. So over all it's pretty water resistant but not waterproof. I have not thrown it in a lake or pond but it appears so. BEST ANSWER: Unfortunately, this item is no longer available.